Let’s get right to it! More noteworthy news coming out of Cannon Cliff again this weekend! 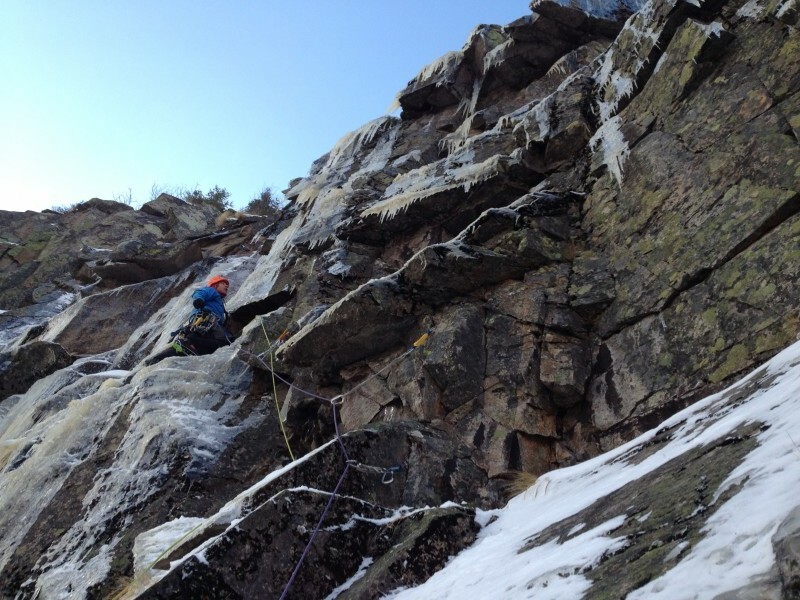 Jeff Previte and Matt Ritter made the second ascent of Prozac on the Omega Wall this past Friday. The mixed route, finishing right of Omega, was first established by Kevin Mahoney and Ben Gilmore in 2002. 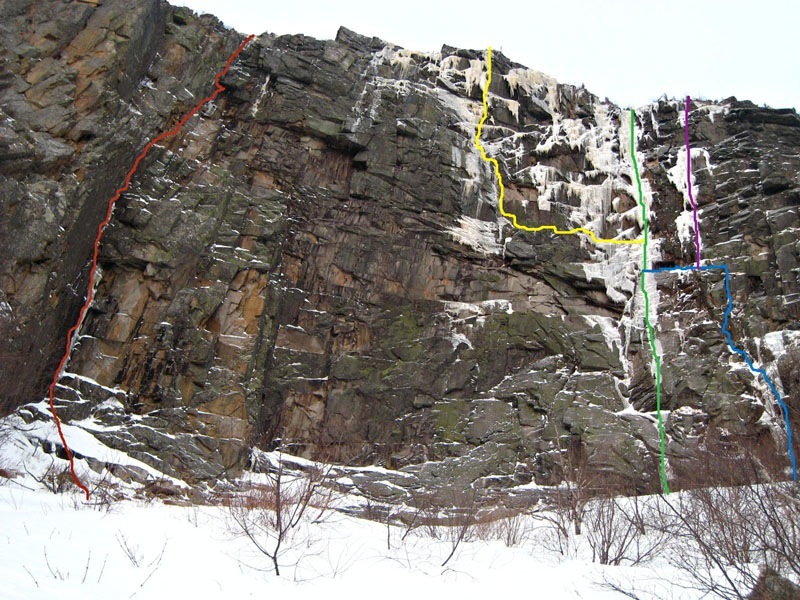 The Omega Wall section of Cannon Cliff, showing (left to right) the Mean Streak (red); the Firing Line (yellow); Omega (green); Omega Variation Start (blue); Prozac (purple). Photo courtesy of Freddie Wilkinson, The Nameless Creature. You can find his whole story remembering that day, on his blog post, Around the next corner? As Jeff and Matt made their way to the base of the climb, Majka Burhardt and Peter Doucette were already on the route. Peter, just coming back from Nepal only 30 hours earlier, was leading the second pitch. Majka and Peter decided to call it a day after three pitches and rappelled down passing by Matt and Jeff. 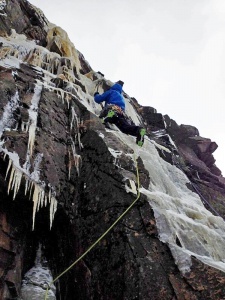 As they continued up, Matt described the third pitch as a “run-out muckle of ‘egg shell’ ice which gave way to a sketchy mantel and an awkward perch beneath the steep, more solid ice.” Sounds fun eh?! 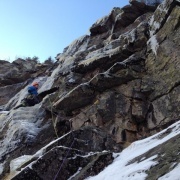 Majka approaching the top of the third pitch. The ledge and belay are shared with Omega. The second party visible below. Photo by Peter Doucette. Now they were perched at the Pitch three belay looking up at the last and final pitch which was waiting patiently, as it had for 12 years. The sun was lowering and the cold air began to penetrate their now shivering bodies, but Matt didn’t need to think about the next move. He was motivated. Nice work guys! To read his entire account of the day, check out his report on Walkabout Wild. Prozac-Jeff” Matt Ritter on Pitch 3. Photo by Jeff Previte. If you are still feeling the symptoms of Seasonal Affective Disorder after that dose of Prozac, here’s some Positive Thinking! Positive Thinking – 2014 from Pig Helmut on Vimeo. It seems climbers everywhere were heading to the hills this past weekend, taking advantage before the warmth and rain hit during the early part of this week. Check out the Photo page for what got done.. including some sweet shots at Lake Willoughby! In Crawford Notch, Mt. Willard offered up a taste of ice and in the Adirondacks, the climbs at Chapel Pond froze long enough to see some action. Now if we can all sit still long enough, waiting for the warm front to move out of here and the cold to return later this week, who knows what we’ll find! ~ Special Thanks to Majka Burnhardt, Peter Doucette, Jeff Previte, Matt Ritter and Jeffery Dunn. The Weekly UPdate! 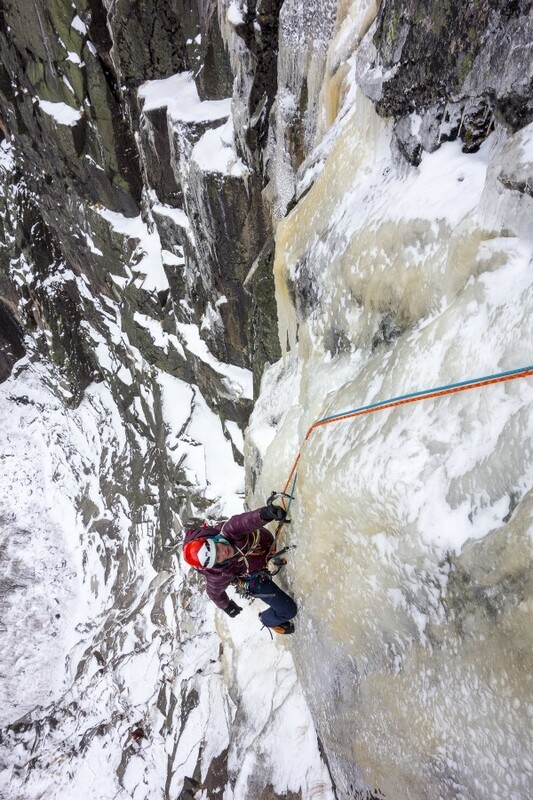 New ADK Ice Guide in the Works!